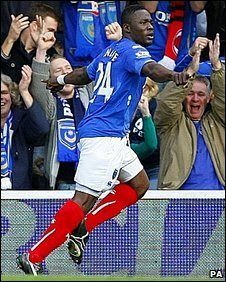 Aruna Dindane scored a hat-trick as Portsmouth completed a memorable week with a superb display at Fratton Park. Dindane dinked over Chris Kirkland to open the scoring before Frederic Piquionne raced clear to make it two. After the break striker Dindane stabbed home from close range and completed his treble from the spot after Kanu was blatantly tripped by Emmerson Boyce. 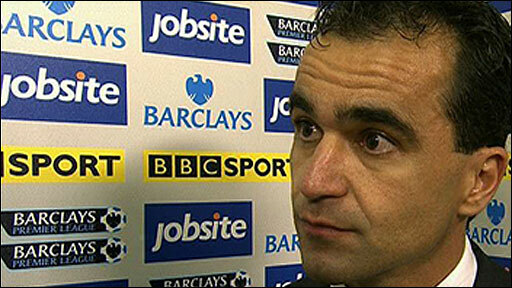 Roberto Martinez's Wigan, who have endured a difficult week off the pitch, never got going and were well beaten. The victory caps a positive few days for Paul Hart's side, who shrugged off a transfer embargo to demolish Stoke by the same score in the Carling Cup. For Wigan, the negative effect of Marlon King's prison sentence will surely not have helped the preparations for this game. Martinez had warned before the match that Portsmouth's lowly league position did not do justice to some of the attractive football they have been playing of late. And the Spaniard was right to be concerned, as Hart's side dominated from start to finish in a thoroughly impressive display. It could have been 5-0 by half-time as the hosts, inspired by the excellent Jamie O'Hara and Michael Brown in midfield, set about building on their crushing midweek win. Piquionne held on to his place in the side after scoring twice against the Potters, and he and Dindane wasted no time in causing the visiting defence problems. Kevin-Prince Boateng had a decent chance as early as the first minute, blazing over from the edge of the box when completely unmarked while O'Hara dragged a shot wide soon after. But Dindane made no mistake just after the half-hour mark as the hosts finally made the most of their near-constant pressure. A perfectly weighted ball from the impressive Brown dissected the ailing Wigan defence and sent Dindane clean through. The Ivory Coast striker still had work to do as he closed in on goal but dinked the ball over the advancing Kirkland in some style. Dindane then turned provider three minutes into first-half injury time - slipping the ball into the path of Piquionne who managed to stay onside despite the Wigan defence's dangerously high line. The striker raced into the box and smashed the ball under Kirkland, who again could not bail out his under-performing team-mates. Wigan's efforts were aptly summed up by Hugo Rodallega's woeful free-kick from 30 yards that was more akin to a rugby conversion, and they continued to struggle after the break. Portsmouth, meanwhile, picked up where they left off with the rampant Dindane seeing a powerful shot deflect off Titus Bramble and go just wide. The Fratton Park faithful suffered a cruel blow moments later though when Piquionne was carried off on a stretcher after a seemingly innocuous clash of heads. The striker went up with Boyce and appeared to be just shaken but was soon taken off wearing a neck brace. It made no difference though as Dindane immediately linked up with substitute Kanu to make it 3-0. O'Hara pulled the ball back to the Nigerian inside the box and from his teasing cross Dindane got in front of the Wigan defence to stab home. Dindane deserved a hat-trick to cap a fine individual and team display, and he was duly given his opportunity from the spot when Boyce tripped Kanu late on. "We got a result for our efforts which has been lacking in recent weeks. We've been working hard for months without having a lot to show for it. "We set off like trains and we kept that up for the full 90 minutes. 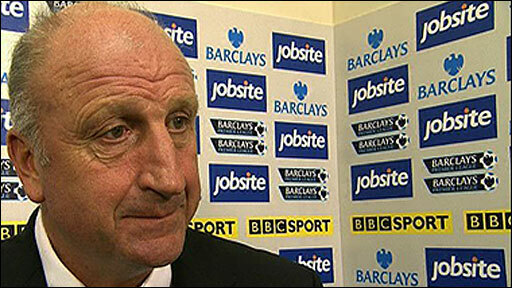 "I've been stood here every Saturday trying to explain why we haven't got the results. That was certainly a reward for our efforts." "We had a couple of half-chances but our standards are a lot higher than that and it just wasn't good enough from us. "No complaints. Portsmouth started the game with huge intensity and that's what we were lacking. "We were chasing the game far too much and the intensity in our play was not enough. "We were nowhere near good enough. When you play like we did today you're going to get punished away from home. We have to go away and put that right." 90:00+4:31 The match has reached full-time. 90:00+3:48 Inswinging corner taken by Jordi Gomez from the right by-line played to the near post, clearance made by Jamie O'Hara. 90:00+1:59 Long distance effort on goal by Younes Kaboul goes wide left of the target. 90:00+1:12 Direct free kick taken by Jamie O'Hara. 90:00+1:12 Booking Hendry Thomas receives a yellow card for unsporting behaviour. 90:00+1:05 Foul by Hendry Thomas on Aruna Dindane, free kick awarded. 89:11 The assist for the goal came from Nwankwo Kanu. 89:11 GOAL - Aruna Dindane:Portsmouth 4 - 0 Wigan Penalty taken right-footed by Aruna Dindane and scored. Portsmouth 4-0 Wigan. 88:14 Penalty awarded for an unfair challenge on Nwankwo Kanu by Emmerson Boyce. 86:07 Centre by Jamie O'Hara, clearance by Emmerson Boyce. 85:38 Outswinging corner taken by Jamie O'Hara from the left by-line. 85:30 The ball is sent over by Hayden Mullins, Titus Bramble manages to make a clearance. 84:00 Substitution Hassan Yebda leaves the field to be replaced by Hayden Mullins. 81:53 Foul by Hendry Thomas on Nwankwo Kanu, free kick awarded. Younes Kaboul has an effort direct from the free kick, blocked by Hendry Thomas. 81:11 Hassan Yebda challenges Charles N'Zogbia unfairly and gives away a free kick. Direct free kick taken by Charles N'Zogbia. 80:02 Scott Sinclair crosses the ball, Header from close range by Hendry Thomas misses to the right of the target. 78:32 The offside flag is raised against Jason Scotland. Free kick taken by David James. 77:03 Unfair challenge on Mario Melchiot by Kevin-Prince Boateng results in a free kick. Mohamed Diame takes the free kick. 74:38 The ball is swung over by Younes Kaboul, save by Chris Kirkland. 73:47 Kevin-Prince Boateng concedes a free kick for a foul on Charles N'Zogbia. The free kick is delivered left-footed by Charles N'Zogbia from left channel, clearance made by Younes Kaboul. 71:50 Olivier Kapo takes a shot. Blocked by Tal Ben-Haim. 70:39 Free kick awarded for a foul by Kevin-Prince Boateng on Charles N'Zogbia. Chris Kirkland takes the indirect free kick. 69:56 Emmerson Boyce fouled by Nwankwo Kanu, the ref awards a free kick. Indirect free kick taken by Emmerson Boyce. 68:45 Charles N'Zogbia produces a left-footed shot from deep inside the area which goes wide of the left-hand post. 67:46 The ball is swung over by Hassan Yebda, clearance by Mario Melchiot. 66:00 Unfair challenge on Jamie O'Hara by Mohamed Diame results in a free kick. Jamie O'Hara delivers the ball, Headed from the edge of the area by Hassan Yebda goes wide of the left-hand upright. 65:41 Jamie O'Hara produces a left-footed shot from just outside the box that misses to the right of the net. 63:59 Assist on the goal came from Nwankwo Kanu. 63:59 GOAL - Aruna Dindane:Portsmouth 3 - 0 Wigan Aruna Dindane grabs a goal from close in to the bottom left corner of the goal. Portsmouth 3-0 Wigan. 63:00 Effort from the edge of the area by Olivier Kapo goes wide of the right-hand post. 62:38 Nadir Belhadj delivers the ball. 62:10 Centre by Aruna Dindane, save by Chris Kirkland. 60:32 Nwankwo Kanu fouled by Emmerson Boyce, the ref awards a free kick. Jamie O'Hara fires a strike on goal direct from the free kick, save made by Chris Kirkland. 58:53 The referee blows for offside. Indirect free kick taken by Chris Kirkland. 58:09 Substitution Olivier Kapo on for Hugo Rodallega. 58:09 Substitution (Wigan) makes a substitution, with Jordi Gomez coming on for Paul Scharner. 57:34 Outswinging corner taken by Jamie O'Hara from the left by-line played to the near post, clearance by Mario Melchiot. 56:07 Substitution (Portsmouth) makes a substitution, with Nwankwo Kanu coming on for Frederic Piquionne. 55:46 Aruna Dindane takes a shot. Blocked by Titus Bramble. 55:15 Aruna Dindane is ruled offside. Titus Bramble takes the free kick. 52:43 The ball is swung over by Kevin-Prince Boateng. 47:52 Inswinging corner taken by Hugo Rodallega from the left by-line. 47:34 Inswinging corner taken right-footed by Hugo Rodallega from the left by-line to the near post. Correction - 47:05 Hugo Rodallega takes a shot. Tal Ben-Haim gets a block in. 47:05 Hugo Rodallega produces a right-footed shot from the edge of the box and misses to the left of the goal. 46:18 Aruna Dindane takes a shot. Save made by Chris Kirkland. 45:00+4:20 The whistle is blown to end the first half. 45:00+2:57 Assist on the goal came from Aruna Dindane. 45:00+2:57 GOAL - Frederic Piquionne:Portsmouth 2 - 0 Wigan Frederic Piquionne finds the net with a goal from deep inside the penalty box low into the middle of the goal. Portsmouth 2-0 Wigan. 45:00+1:53 Jamie O'Hara produces a cross, Emmerson Boyce manages to make a clearance. 45:00+1:17 Nadir Belhadj produces a cross, clearance made by Emmerson Boyce. 45:00+0:43 Outswinging corner taken left-footed by Jamie O'Hara from the left by-line, clearance made by Mario Melchiot. 45:00+0:04 Free kick awarded for a foul by Charles N'Zogbia on Aruna Dindane. Jamie O'Hara crosses the ball from the free kick left-footed from right wing, clearance made by Titus Bramble. 44:04 Tal Ben-Haim concedes a free kick for a foul on Hugo Rodallega. Hendry Thomas takes the free kick. 42:57 Effort from inside the six-yard box by Jason Scotland goes wide left of the target. 41:27 The ball is crossed by Frederic Piquionne. 40:31 Substitution Nadir Belhadj on for Steve Finnan. 37:31 Hugo Rodallega takes a shot. Blocked by Kevin-Prince Boateng. 35:53 Hugo Rodallega takes a inswinging corner to the near post, Kevin-Prince Boateng makes a clearance. 34:18 The assist for the goal came from Michael Brown. 34:18 GOAL - Aruna Dindane:Portsmouth 1 - 0 Wigan Aruna Dindane finds the back of the net with a goal from inside the area to the bottom right corner of the goal. Portsmouth 1-0 Wigan. 33:53 Free kick awarded for a foul by Jason Scotland on Michael Brown. Younes Kaboul takes the indirect free kick. 32:08 The offside flag is raised against Aruna Dindane. Free kick taken by Chris Kirkland. 29:25 Marc Wilson concedes a free kick for a foul on Paul Scharner. Shot on goal comes in from Hugo Rodallega from the free kick. 28:52 Frederic Piquionne takes a shot. Chris Kirkland makes a save. 28:03 Kevin-Prince Boateng produces a left-footed shot from outside the penalty area and misses left. 27:57 A cross is delivered by Jamie O'Hara, Emmerson Boyce makes a clearance. 25:50 A cross is delivered by Kevin-Prince Boateng, Aruna Dindane has a header from close in and clears the crossbar. 25:18 Corner taken left-footed by Jamie O'Hara, Mario Melchiot manages to make a clearance. 24:42 Jamie O'Hara takes the inswinging corner, save by Chris Kirkland. 23:41 Effort from just outside the area by Jamie O'Hara goes over the bar. 23:35 Jamie O'Hara produces a cross. 23:06 Corner taken by Jamie O'Hara from the right by-line. 22:30 Kevin-Prince Boateng takes a shot. Titus Bramble gets a block in. 21:32 Paul Scharner challenges Kevin-Prince Boateng unfairly and gives away a free kick. Direct free kick taken by Jamie O'Hara. 20:55 Jamie O'Hara takes a shot. Chris Kirkland makes a save. 17:35 The ball is delivered by Jason Scotland, Tal Ben-Haim makes a clearance. 15:35 The assistant referee signals for offside against Frederic Piquionne. Indirect free kick taken by Titus Bramble. 14:54 Free kick awarded for an unfair challenge on Hendry Thomas by Aruna Dindane. Chris Kirkland restarts play with the free kick. 13:59 Free kick awarded for a foul by Marc Wilson on Paul Scharner. Free kick crossed right-footed by Hugo Rodallega from right channel, clearance made by Hassan Yebda. 12:32 Marc Wilson has an effort at goal from long distance that misses to the right of the target. 12:02 Hendry Thomas gives away a free kick for an unfair challenge on Jamie O'Hara. Tal Ben-Haim takes the indirect free kick. 10:09 Mohamed Diame gives away a free kick for an unfair challenge on Hassan Yebda. Jamie O'Hara takes the free kick. 8:51 Unfair challenge on Mohamed Diame by Hassan Yebda results in a free kick. Direct free kick taken by Hendry Thomas. 6:37 Effort from the edge of the box by Jamie O'Hara goes wide of the left-hand post. 4:01 Free kick awarded for a foul by Jamie O'Hara on Mohamed Diame. Hendry Thomas takes the free kick. 2:58 Jamie O'Hara takes a shot. Titus Bramble gets a block in. 1:31 Corner taken left-footed by Jamie O'Hara, Hassan Yebda has a headed effort at goal from close range which goes wide of the left-hand post. 1:21 A cross is delivered by Aruna Dindane, Titus Bramble manages to make a clearance. 0:27 Kevin-Prince Boateng produces a right-footed shot from just outside the box that goes wide right of the target. 0:00 The match gets underway.